When Buddha started ordaining his followers, they wore simple robes and shaved their heads in order to symbolize letting go of their previous social ties and castes. A Brahmin and a lowly untouchable joining his community would, in theory, have the same robes and outward appearance. This was a revolutionary step when caste differences were more powerful than anything that has ever existed in Europe or America. So the robe originally meant, “I’m nothing special, no better or worse than the others.” The construction of the robe was simple and practical, for the time and place, and has been adapted and used by Buddhist monastics ever since. In Tibet, the robes are wool instead of cotton. 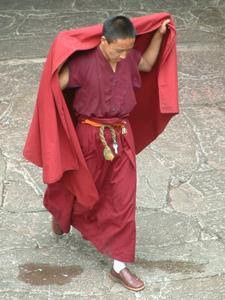 Most monks wear the upper robe over their left shoulder, leaving the right arm free for writing, picking things up, etc. Here in the West, today, the robe can mean different things. One of my teachers, Catherine Jetsun Yeshe, always wears an upper robe when she teaches. I also have a dear friend who was given a robe by his teacher (also a Westerner) and told to wear it whenever he meditates. It was important to him to honour that instruction, so he does. 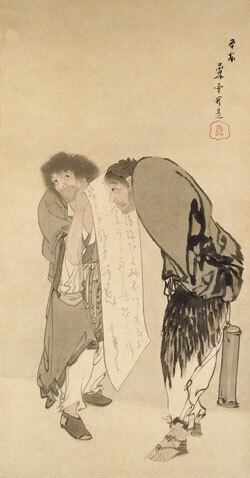 I think in these cases the robe is a way of signalling a change in how the wearer relates to the world. Nevertheless the adoption of Eastern monastic dress by Westerners raises many interesting questions about cross-cultural identity, institutions, and the function of monastic garb in the process of waking up. Seeing a Western person wearing robes gives me a completely different impression from that given by a Tibetan. I often have the impression that they are trying to become somebody else, whereas Tibetans seem to me to be completely at ease in robes. At least part of this is simple prejudice, coming from my own patterns. For the most part I find that recreating setting and dress for Tibetan practices by wearing monastic robes, constructing elaborate shrines, chanting in Tibetan, etc., is not particularly helpful for most Western people. For me, and for the people I work with, plain English and ripped jeans in a community centre seem to create less confusion.